Start your morning out right with these Sweet Potato Pancakes! This healthy pancake recipe is made with 100% oat flour and sweet potato puree and are packed with vitamin A and fiber so you’ll feel energized all day long. Sweet Potatoes, I loved them before I blogged, I love them now, and I will love them when I’m old and grey. When the North Carolina Sweet Potato Commission reached out to me for a partnership I didn’t have to think twice. It was an obvious YES. I can’t help myself when it comes to this sweet, satisfying, and versatile orange (sometimes white and sometimes purple) spud. 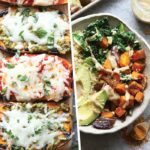 If you’ve been keeping up with FFF’s latest sweet potato posts you’ve seen the Southwestern Sweet Potato Nachos, Sweet Potato Hash Cups, How to Roast Sweet Potatoes, Baked Cheddar Sweet Potato Fritters, Sneaky Sweet Potato Skillet Brownies and now? These magnificent Sweet Potato Pancakes. SO MUCH SWEET POTATO LOVE. Before we talk about these delicious looking pancakes, let’s chat about why we love sweet potatoes so much. A medium sweet potato provides 4 times the amount of recommended vitamin A. Vitamin A supports vision health, bone development, and immune function. If you’re looking to up your vitamin C intake, sweet potatoes are for you. You’ll find 35% of your daily recommended amount of vitamin C in a medium sweet potato. Vitamin C is great for absorbing iron, fighting infection, and healing wounds. Sometimes it’s hard to find a nutritious vegetable that will keep you fuller, longer. Sweet potatoes are fiber rich so they are sure to keep you satisfied until your next meal. Sweet potatoes are made up of complex carbs, so no sugar highs and no sugar lows! You can prepare sweet potatoes in so many different ways; pureed, baked, roasted, grated, etc. 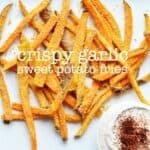 Sweet potatoes are great in sweet AND savory dishes. Who doesn’t love a vegetable who can be turned into fries? 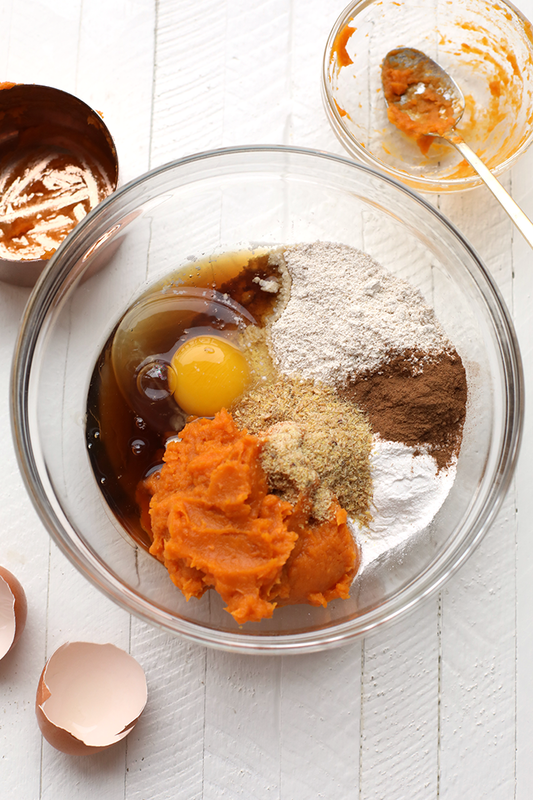 The fact that you can mix eggs, flour, and sweet potato puree together to make delicious and healthy pancake recipe, still blows my mind sometimes. You can puree your own sweet potato (learn how to HERE) or you can buy pureed sweet potatoes at the store, they will both work just fine! These sweet potato pancakes are my favorite healthy pancakes so far on FFF. We all know I’ve had quite a few pancakes in my day. They are perfect for a lazy Sunday morning or for a meal prep breakfast for the week. By the way, if you’ve never meal-prepped pancakes, it’s amazing. All you do is make a batch or two of pancakes, let them cool, then throw them in a freezer safe bag for later. When you’re feeling like pancakes on a weekday morning, all you have to do is throw them in a toaster and BAM. Pancakes. I love to serve these sweet potato pancakes with a little bit of almond butter and maple syrup, but if you’re craving savory breakfast, try serving them with a fried egg. YUM. In a medium bowl, mix together dry ingredients. Set aside. In a large bowl, whisk together wet ingredients. Then, slowly add wet ingredients to dry and mix until there are no lumps. Heat a skillet to medium heat and spray with coconut oil cooking spray. Use around a 1/3 cup scoop and pour batter onto skillet. Cool for around 2-3 minutes per side. 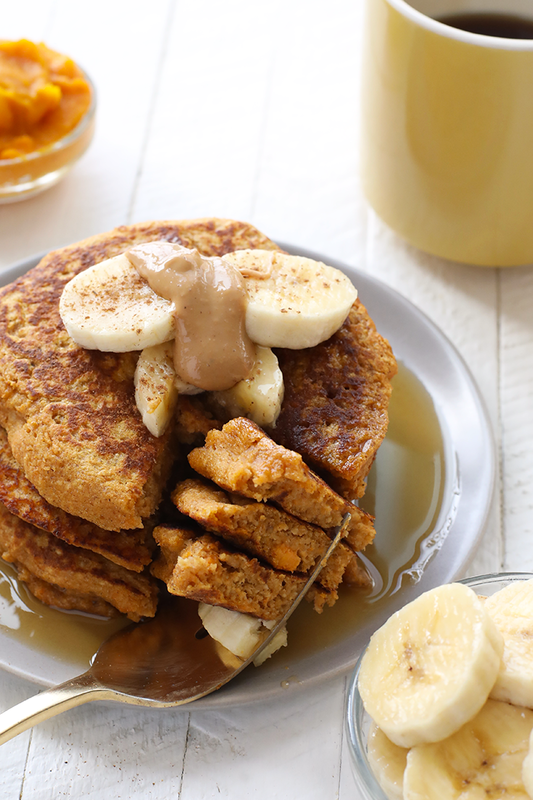 Serve with almond butter and maple syrup! PS: HAPPY BIRTHDAY TO ME (yesterday) :D I hope 27 is as good as 26. This post is sponsored by the NC Sweet Potato Commission. 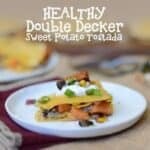 Thank you for supporting Fit Foodie Finds and my love for sweet taters! I was compensated and all opinions are my own.